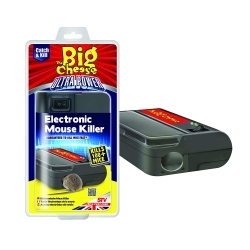 The Big Cheese Ultra Power Electronic Mouse Killer. Home The Big Cheese Ultra Power Electronic Mouse Killer. The Big Cheese ultra power electronic mouse trap is a quick, effective and humane way to kill rodents. It kills in seconds and an indicator display lets you know when the trap needs resetting. You can dispose of the rodent without touching it. Each set of AA batteries (not included) provides 100+ kills. Kills in seconds and Indicator display lets you know when the trap needs resetting. 3 Rat Bait Stations & 200g Bait.